found dead with his body doused with kerosene and lighters in his hand due to suspected poisoning in Luchu region, Amdo on January 19 2013. He attempted setting himself on fire for protest. "Father and mother, it is my hope that you will take care of yourselves. You are the most loving people in this world. I will repay your kindness in my next life." - a phrase from his will written neatly on the sheet of paper. Jigjey Kyab in an undated photo. DHARAMSHALA, January 24: A teenaged Tibetan was found dead with his body doused with kerosene and lighters in his hand due to suspected poisoning in Luchu region of eastern Tibet. On January 19, the body of Jigjey Kyab, 17, soaked with kerosene and with two lighters in his hands, was recovered from a busy street in the Shigtsang Pungkor region of Luchu. 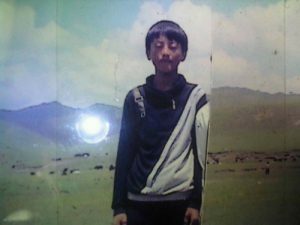 In earlier instances, surviving Tibetan self-immolators have suffered amputations of all limbs, verbal abuse, interrogations, and maltreatment by doctors and Chinese officials at the hospitals. 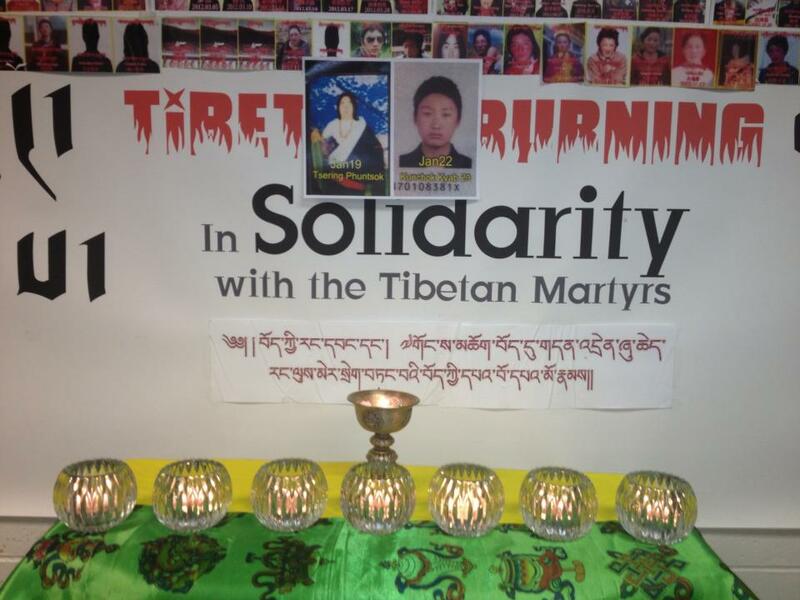 The condition of more than a dozen Tibetan self-immolators remains unknown. Following the incident, local Chinese security personnel visited the deceased’s family for interrogations. 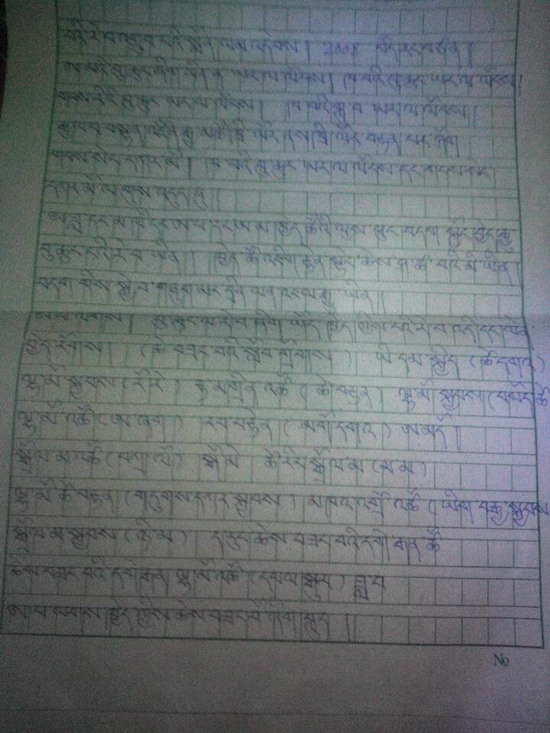 In a last note left by his bedside, which was later found by his family members, Jigjey Kyab has called on Tibetans to rise up. "I pray that my aspirations will be fulfilled. If you are your mother’s son - rise up. Sons of the Land of Snows - rise up. Singers of the Snow Land - rise up. May His Holiness the Dalai Lama live for thousands of aeons. My respect to the white snow lion (symbol of Tibet). My prayers for happiness in Tibet." Jigjey Kyab's last hand written note. 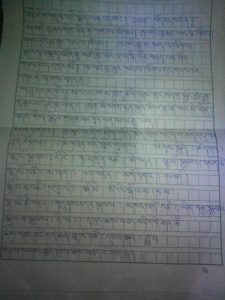 He further made an emotion appeal to his parents in his handwritten note written in Tibetan, dated January 19, the day of his self-immolation attempt. "Father and mother, it is my hope that you will take care of yourselves. You are the most loving people in this world. I will repay your kindness in my next life." According to the same source, Jigjey Kyab was cremated three days later on January 22, after perceived pressure and warnings from the Chinese authorities. Jigjey Kyab is survived by his father Dhugkar Kyab, mother Dekyi Tso and sister Choekyong Tso. 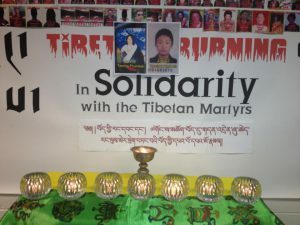 Last month, Pema Dorjee, 23, passed away in his fiery protest in Luchu, while raising slogans for the return of His Holiness the Dalai Lama and Tibet’s independence. Four self-immolations have occurred in the Luchu region alone.